Fourteen people have been killed in the Southern Highlands and Hela Provinces in Papua New Guinea by the powerful earthquake and aftershocks that hit early Monday morning. Acting Hela police commander Thomas Levongo said nine people were reported killed in Hela while sources in Mendi claimed five killed. All were killed reportedly when they were sleeping in their falling houses. But Police in Mendi said 14 people were killed in the initial quake, including three in Poroma, south of Mendi. “They were killed by landslides destroying families sleeping in their houses,” said Naring Bongi, a police officer in Mendi. 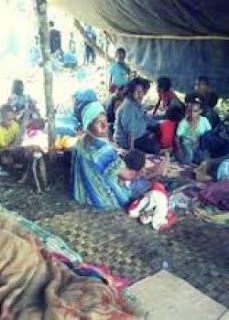 The PNG disaster management office said it was verifying the reports but it could take days to confirm a death toll. With a lack of communications preventing a clear assessment of damage, aid agencies had not yet begun relief efforts, said Udaya Regmi, head of the International Red Cross in Papua New Guinea, in Port Moresby. “The magnitude of the earthquake is quite huge, so there must be an impact ... but we cannot say how many people are actually affected and what they need,” Regmi said. Landslips and sinkholes in many parts of the two provinces had created unprecedented catastrophies, ammounting to millions of kina in repair costs. Several sections of the highway were blocked by landslips and sinkholes while structural damages included cracks on the road surfaces. The earthquake which struck around quarter to four caused whole mountain sides to fall off, rumbling towards villages below, sending unsuspecting sleeping locals to wakeup and flee for their lives. The quake caused massive destruction right across the two provinces with the most notable areas near the Highlands Highway in villages of Assisi in Imbongu, Nipa, Poroma, Tari and Komo-Margarima districts. Heavy trembling from aftershocks continued sparodically in the two provinces throughout the day and night on Monday and yesterday. A whole section of the Tubiri limestone near Mendi town, made famous by local artist Agustine Emil in his song TLS, broke off and rumbled down to the Mendi River. The earthquake which is alleged to be the biggest in the region, caused communication and power blackouts in Hela and Southern Highlands on Monday and yesterday. The massive earthquake toppled a very large number of houses, fences, walls, power pylons and trees. Meanwhile, Prime Minister Peter O’Neill has announced an emergency meeting of the National Executive Council today. The Prime Minister was accompanied on an aerial inspection by Members of Parliament from Hela and Southern Highlands but cut short his visit at Ambua due to bad weather but managed to visits some parts of the two provinces. He said the urgent emergency NEC meeting today will discuss and endorse funds to rebuild infrastructures destroyed by the Monday morning earthquake. O’Neill said an aerial view of the area indicated that a lot of roads, bridges and public structures had been destroyed as well as properties belonging to villagers. He said damages had also been done to properties of oil and gas operators in the province and non-essential staff have been evicted through Moro as planes are able to operate in and out of Moro only. The Prime Minister also thanked the hard-working public servants, the communication service providers and PNG Power for working under extreme difficulty in restoring the basic services to the affected areas. O’Neill said that officers from the National Disaster Office were compiling a report for him for the special NEC meeting. He plans to visit earthquake-damaged areas again tomorrow.